1. What’s different about Irish Genealogy? One of the most important resources for Irish family history is the Index to Civil Registration. In Ireland Civil Registration began in 1864 (non-Catholic marriages were recorded from 1845). The index is laid out like a phone book, with people's names listed in alphabetical order, alongside each name is a volume and page number. These relate to the location of the birth, marriage or death in the full register. These records are arranged by the date the event was registered. It is important to bear this in mind for births, marriages or deaths that occurred in November or December but which may not have been registered until January of the following year. The original civil registration districts were based on 160 medical dispensary districts and in many cases cut across county boundaries. This means that in certain cases events will be recorded in a county other than where the person lived. We have provided a reference map showing the borders of the registration districts, and list of the registration districts and their associated counties below (please scroll to the bottom of the page for the registration districts list). Before Civil Registration began in 1845/64 life events were recorded at a local level in the parish church. While some are now available online, most are still held locally or in archives. Many Roman Catholic parish registers are available on microfilm in the National Library of Ireland and can be consulted in person. Some registers for Cork and Ross, Dublin and Kerry are available online at the Department of Tourism, Culture and Sport’s Irish Genealogy website. Church of Ireland registers are either held in manuscript form at the Representative Church Body Library in Churchtown, Dublin 14, on microfilm at the National Archives of Ireland, at the Public Record Office of Northern Ireland, Belfast (Northern Ireland parishes) or in local custody by the rector. Some Church of Ireland parish records relating to Carlow, Dublin and Kerry are available online at the Department of Arts, Heritage and the Gaeltacht’s Irish Genealogy website. Methodist records between 1747 and 1817-18 are usually entered without distinction in the Church of Ireland parish registers. Presbyterian parish records for the counties of Northern Ireland are kept mainly in the Public Record Office of Northern Ireland, while those for the Republic of Ireland are usually held locally by the minister. Quaker (Religious Society of Friends) records are held in repositories in Dublin, Ireland and Lisburn, Northern Ireland. Most Jewish records can be accessed through the Irish Jewish Museum in Dublin. Gravestones and Church memorials are an important tool for Irish genealogical research, especially in the absence of any papers records. The records on our site are the result of the dedicated work of historians who travelled to graveyards transcribing the names and dates found on gravestones and plaques. We give you access to a collection of over 250,000 obituaries and other newspaper notices compiled from all over Ireland. The Tipperary Clans Archive comprises, principally, obituaries, death/funeral notices and burials transcribed from regional newspapers pre 1864. Byrne's Irish Times abstracts is another valuable collection of transcripts of almost 200,000 notices from that newspaper. Although the majority of wills and testamentary records for Ireland prior to 1922 were destroyed in the fire at the Public Records Office, a number of records, including indexes and calendars, as well as some wills survive which go some way to filling in the gaps left in 1922. 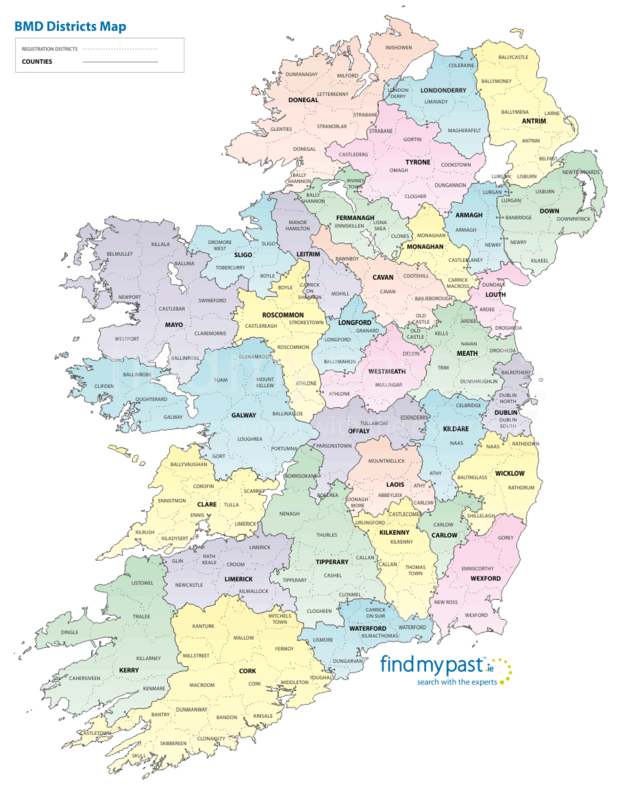 Acknowledgements: we extend grateful thanks to the National Library of Ireland for permission to use their Poor Law Union map in the creation of our BMD Districts Map.